Less than a year after offering tepid support for lane splitting the American Motorcyclist Association has delivered a much stronger endorsement of the riding technique. The endorsement comes on the release of preliminary results of research showing that riders engaging in lane splitting are no more likely to suffer serious injury than other riders, and that, in fact, in many cases they are better off. The AMA this week drew attention to two studies taking place in California: the University of California, Berkeley's Safety Implications Of Lane-Splitting Among California Motorcyclists Involved In Collisions, and a joint study by SafeTREC and the California Office of Traffic Safety called the Motorcycle Lane-Share Study Among California Motorcyclists And Drivers 2014 And Comparison To 2012 And 2013. Collectively the studies look at data from motorcycle-involved traffic incidents as well as the behaviors of several groups of California riders. California is the only U.S. state where lane splitting is permitted. Sometimes known as "filtering," lane splitting is the act of riding between lanes of traffic. Proponents of the technique say it helps protect riders from rear-end collisions and ultimately helps to ease traffic congestion. The technique is widely permitted in most parts of the world and is particularly popular in the crowded urban centers of Europe. It has been permitted in California for decades, however AMA support of the technique was particularly slow in coming. It was not until recent years, when a number of internet campaigns started drawing attention to the issue, that the AMA agreed to even consider taking a stance on lane splitting. Late last year, the AMA finally gave a muted blessing to the practice, disappointing many lane splitting proponents who had hoped to see more robust support. That support now appears to be coming. In a recent media release, the AMA described lane splitting as "a relatively safe maneuver" and AMA Vice President of Government Relations Wayne Allard said that "responsible lane splitting is a safe and effective tactic for riders." Referencing efforts to extend lane splitting rights elsewhere in the United States, Allard added: "The AMA endorses these practices and will assist groups and individuals working to bring legal lane splitting or filtering to their states." Support for lane splitting appears to have increased considerably in recent years. Many suggest this is because traffic congestion in most American cities is worsening and because increasing numbers of riders are choosing lighter, more agile motorcycles, which are better suited to the task of moving between lanes of traffic. Some riders and groups -- including a number of ABATE branches -- remain opposed to lane splitting. Allard suggests this may be because those riders don't fully understand how lane splitting works. "Motorcyclists who oppose lane splitting should remember that it is optional," he said. "Permitting lane splitting is not the same as requiring it. So, those opposed to the practice should consider the desires of other motorcyclists who believe they would benefit from it. 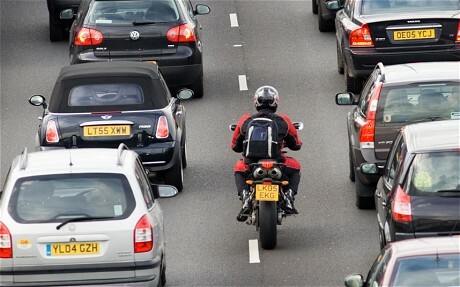 Lane splitting is an issue of choice." Lane-splitting motorcyclists involved in crashes were notably less likely than other motorcyclists in crashes to suffer head injury (9.1 percent vs. 16.5 percent), torso injury (18.6 percent vs. 27.3 percent), or fatal injury (1.4 percent vs. 3.1 percent) than other motorcyclists. The proportion of motorcyclists with a head injury was 6.3 percent for those lane-splitting consistent with the "safe and prudent" traffic speed guidelines, 10.7 percent for those lane-splitting in traffic flowing at 30 mph or less but exceeding the traffic speed by more than 10 mph, 9 percent for those lane-splitting in traffic flowing faster than 30 mph but exceeding traffic speed by less than 10 mph, and 20.5 percent for those who were lane-splitting in traffic flowing at more than 30 mph and who were exceeding traffic speed by more than 10 mph.